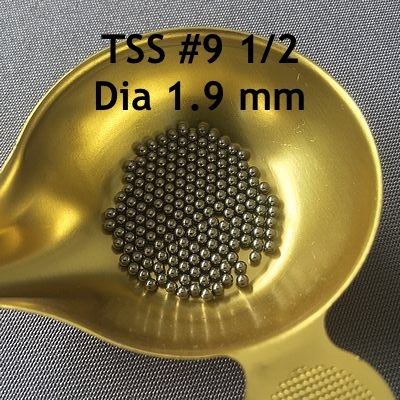 The TSS # 91/2, diameter 1.9 mm is a very interesting ball. This is the lead equivalent of a ball of 6 at the penetration level which makes it a ball to do everything for waterfowl. TSS # 91/2 (1.9 mm) can be used to shoot small and medium sized ducks (teals, wingeons) and large waders up to a minimum of 60 m. In fact, the 30 mm penetration is reached up to 65 m and the pattern density at 60 m remains of almost 4.5 per dm² for a conventional 32 gram load. Well adapted to the small calibres, it will give its full measure for loads from 28 to 36 grams and allow to reach, on already well built birds of the extreme ranges. The lethality on mallard is of 50 m, on teal of 65 m and on average ducks of the order of a small 60 m. In small load (24 grams), it will be effective on all ducks up to 50 m.